I once heard that ideas are like living spirits of energy - floating and skipping around the world, from person to person, waiting for someone to make them a reality. If you wait around and ignore them, they’ll be sure to skip town and find a different suitor. Last year, I saw a glimpse of an idea that someone offered me -Ecofeminism - an idea about women and nature, figures and flowers. Intrigued, I took mental note of it, folded the corner of that page, saved that idea for later. Several weeks ago while taking a shower, a more evolved, complete idea came to me. As if it had been growing and thinking on it’s own this whole time. Before I continue, I can’t help but stop and touch on the magic showers have to clear our headspace. Is it because we have no distractions? Is it because we are alone? Naked? Vulnerable? Are we literally washing away the old and allowing the steam to open our pores, making way for the new? Or perhaps, it’s just one of those rare moments in our day that is silent. Quiet. We can hear our own thoughts and hear what God, the Universe or that idea has to say. Okay, back to my idea. I am creating a body of work of figures and flowers. Not only do I love drawing and painting these subjects, but I see them as a beautiful medium to further explore, personify and symbolize the feminine energy of Mother Nature. I’ve had a life long relationship with Lake Michigan and find the personification of Her to be both brilliant and powerful. For this series, I am creating pairs of paintings. For every figure, there is a corresponding flower. I have taped and tacked the pages to my studio wall and I paint each subject in tandem. My brush and paint span the left of one page to the right of the other. They share marks and a color palette. The compositions are arranged so that the two paintings communicate with each other, inviting the viewer to witness their dialogue. 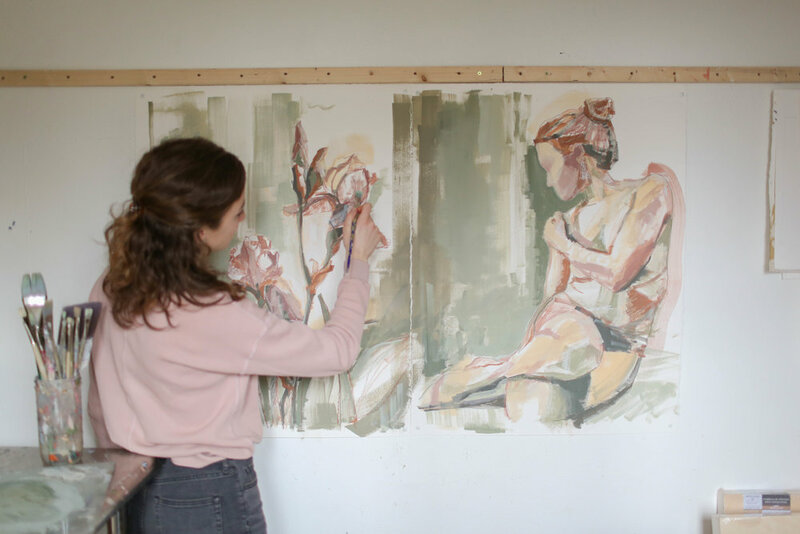 I am experimenting with unexpected combinations of earthy color palettes and gestural marks to further emphasize the influence that nature and feminine energy has in these works. Now, my ideas can overwhelm me sometimes and I don’t always clearly articulate them. And as an artist working from home, I often crave the company of women to share casual conversations and ideas with while at work. Perhaps born out of a nostalgia for school days filled with creative prompts and group projects, I invited a handful of talented friends to give a voice to these pairs of paintings. I gave them complete creative freedom - they may share a poem, quote, lyric, essay, script, monologue… any format that resonated with them. Each woman has some connection to Michigan and/or the Great Lakes. They either practice a creative profession or pursue creative expression in their free time. Many have travelled all over the world and lived abroad, all the while holding their creativity close and leading these beautiful, unique journeys. I’m proud to know each of them and am excited to grow our relationships with this project. My hope is that this series openly invites fresh voices and perspectives, different from my own. Each writer will be involved in naming the paintings and I will share each writing piece with the artwork that matches one by one in my journal. In each post you’ll also get to learn more about the writer, her story and where you can stay connected with her. The paintings are all mixed media on heavy weight cold pressed paper. They will be mounted on panel and set in a neutral maple wood floater frame. If you would like to purchase a pair together you may email me at hello@katherinecorden.com to learn the best way to do that. Otherwise they will be listed individually. I love the idea of two women in separate places sharing “sister” paintings. More to come soon. Thank you for reading. 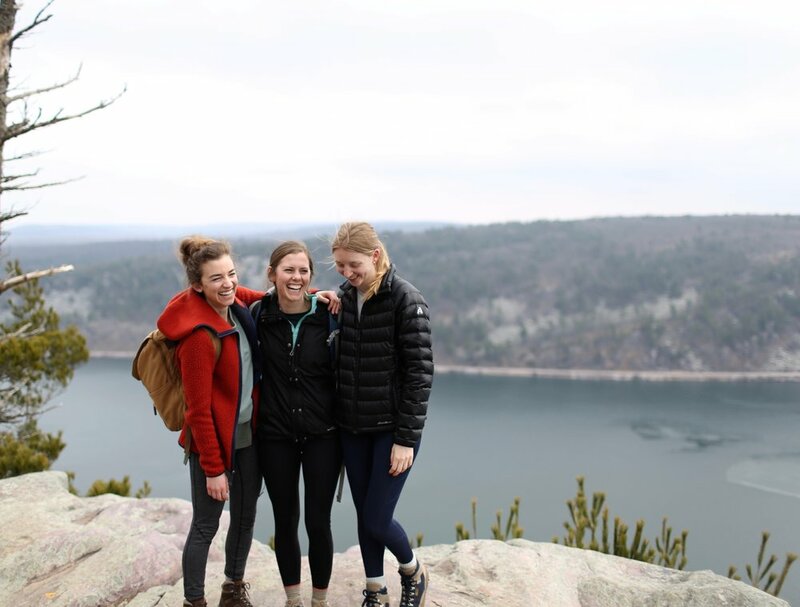 Me and some of my dear girlfriends at Devil’s Lake this past weekend enjoying a hike and spring’s final awakening.